In November 2016, the University of Houston-Downtown Archives wrote about their staff’s annoyance at headlines about items “Found Buried in the Archives!” Articles like these often rub staff in archives the wrong way, because they render their ongoing efforts (necessary for scholars to uncover such material) invisible. Working day-to-day in the archives of a university, library staff members often know much more about our institutions than we’re ever able to share in writing, leaving it to the researchers who visit us to record most of the stories that the materials we show them reveal. It is sometimes our jobs to tell the stories of our schools, but not always; even when it is, there will never be enough time for us to write them all down. Discoveries are made on a daily basis, “buried” materials or not. Princeton University’s Seeley G. Mudd Manuscript Library often highlights archival collections from new angles or reveals forgotten stories about Princeton’s past. In order to do this, I keep records of what I discover in the course of my workday. Themes sometimes emerge and eventually become social media posts, blogs, or exhibit fodder as I transform the messy notes on my legal pads and Word documents and the connections in my head into more coherent pieces for public consumption. I also recruit my student assistants to help in this endeavor. Just as I do, they sometimes intentionally set out to tell a specific story, but we also write the stories that find us rather than vice versa. Our discoveries about Princeton’s connections to slavery reflect this kind of intentional serendipity (not quite the oxymoron it seems). The work of Mudd’s Public Services is both visible and invisible to the patrons who use our library. This essay will reveal some of the invisible work that we do to support Princeton’s educational mission and how it contributed to research on Princeton’s connections to slavery. I uncovered one especially significant source in the course of collecting items for the weekly blog feature, “This Week in Princeton History.” The notice of a slave sale held at the President’s House on campus in 1766 was of particular interest to the public we serve, in part because Professor Martha Sandweiss’s undergraduate Princeton and Slavery seminar was investigating the university’s links to slavery. Sandweiss referred to the slave sale in an article about her class that appeared in The Nation in December 2015. My student assistants also found materials later used by the Princeton and Slavery Project. When Natalie Fahlberg (class of 2018) was working on a long-term digitization project in the Office of the President Records, she noticed an indenture contract for an African American child and pointed it out to University archivist Dan Linke and me. This information was then passed on to Sandweiss’s student researchers. 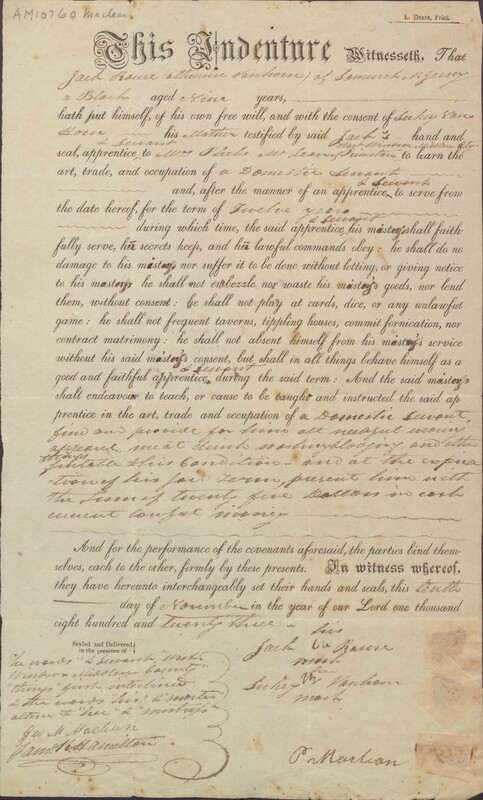 1823 indenture contract for Jack Rouse, a nine-year-old African American boy. Rouse's mother indentured him to "Phebe McLean," likely the widow of college professor John Maclean Sr.
Zachary Bampton (‘2020) was at work on a blog post about language at Princeton and was examining issues of the Nassau Rake to find specific examples of outdated words and phrases. In the process, he found an 1860 play mocking a black abolitionist. The play called him “Honeyman,” a Princeton slang term dating back at least to the mid-18th century that roughly translates to “unoriginal (in the sense of plagiarism)” or “copycat.” Though the play makes little sense to a modern audience, I was able to determine how it reflected student attitudes toward slavery in the early 1860s. My interpretation that the author was mocking the black abolitionist as someone who couldn’t think for himself required familiarity with Princeton’s defunct modes of expression. This kind of specialized knowledge, arising from daily contact with archival materials, is another form of assistance we offer to researchers. Excerpt from an 1860 play mocking a black abolitionist, published in the Nassau Rake. 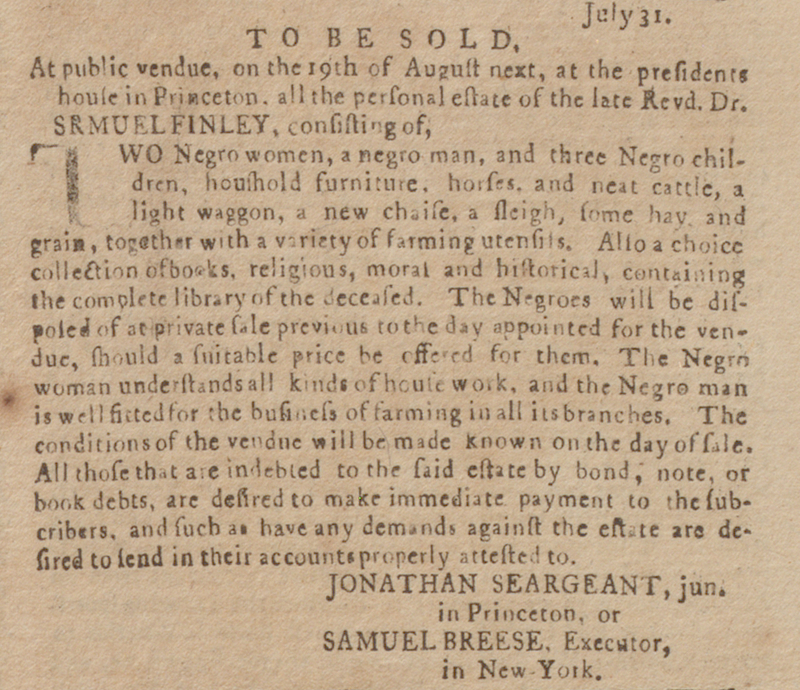 Although library staff members were not specifically looking for Princeton’s connections to slavery in any of these examples, we knew that it was an issue of interest for faculty and students who use the special collections. In the course of our work, we collected this information and organized it thematically, just as we do with respect to other topics. These materials that archivists discover can then be utilized by the community of researchers at Princeton and beyond. Sometimes archivists’ research appears in library blogs or exhibits, but much of the time—perhaps most—our work remains a largely invisible support system, an unseen aspect of Princeton’s commitment to learning and public service. “Found Buried in the Archives!,” Confluence: A Meeting of History and Archives at University of Houston-Downtown, accessed 30 August 2017, https://uhdarchives.wordpress.com/2016/11/28/found-buried-in-the-archives. “This Week in Princeton History for August 28-September 3,” Mudd Manuscript Library Blog, accessed 30 August 2017, https://blogs.princeton.edu/mudd/category/this-week-in-princeton-history. April C. Armstrong, “This Week in Princeton History for August 17-23,” Mudd Manuscript Library Blog, accessed 30 August 2017, https://blogs.princeton.edu/mudd/2015/08/this-week-in-princeton-history-for-august-17-23. Martha A. Sandweiss, “Woodrow Wilson, Princeton, and the Complex Landscape of Race,” The Nation, 1 December 2015, accessed 30 August 2017, https://www.thenation.com/article/woodrow-wilson-princeton-and-the-complex-landscape-of-race. Indenture contract for Jack Rouse, 10 November 1823, Office of the President Records, Box 8, Folder 3, Princeton University Archives, Department of Rare Books and Special Collections, Princeton University Library. Indenture contracts like these did not commit someone to a lifetime of servitude, but rather for a specified period. Fahlberg was particularly struck by the age of the African American child supposedly willingly entering into a contract of 12 years. At age nine, it would seem unlikely that he was indentured of his own free will. Zachary Bampton and April C. Armstrong, “Do You Speak Princetonian? : The Language of Princeton,” Mudd Manuscript Library Blog, accessed 30 August 2017, https://blogs.princeton.edu/mudd/2017/05/do-you-speak-princetonian-the-language-of-princeton. For a partial explanation of the use of the term at the College of New Jersey (now Princeton University), see “Honeyman,” Nassau Literary Magazine 43, No. 2 (1 June 1887): 102-105. 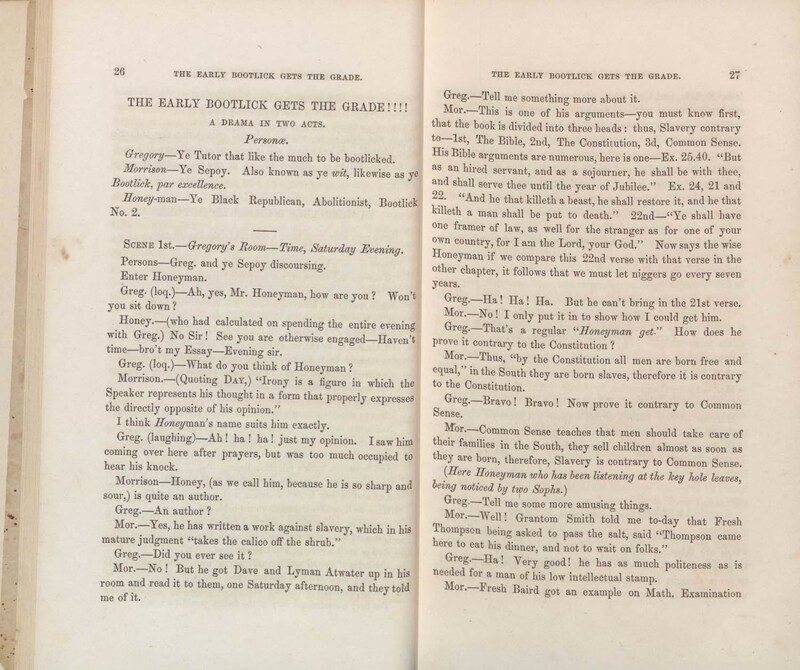 “The Early Bootlick Gets the Grade: A Drama in Two Acts,” Nassau Rake (1860): 26-28.